As I’ve mentioned a few times, for me an important part of food is about the meaning in what we cook and eat, and the connections created with other people through this process. 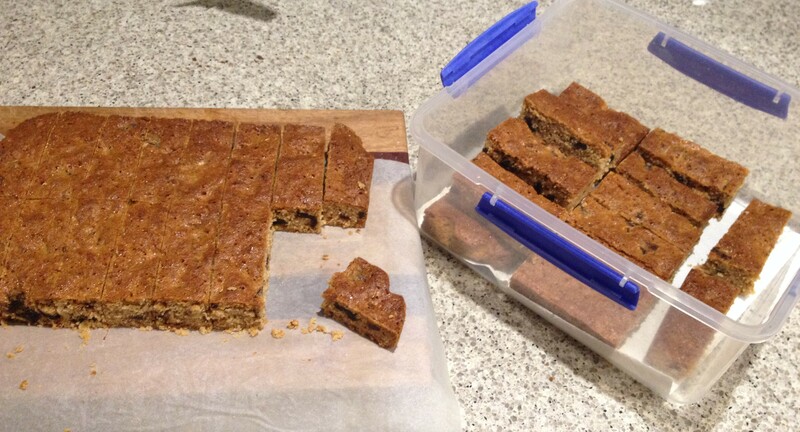 In my family, many of the recipes that have come to be favourites are named after the people who first made them for us, hence: Jenny Murphy’s German Coffee Cake; Ken’s Chook Pie; Mel’s Thai Chicken with Hokkein Noodles; Siobha’s Lentils and Miso; and this one – Johneen and Ernst’s Wholemeal Honey Date Bars. These were originally made by wonderful friends of my parents who always arrived at our rural property with gifts and energy and great ideas – as well as honey date bars! 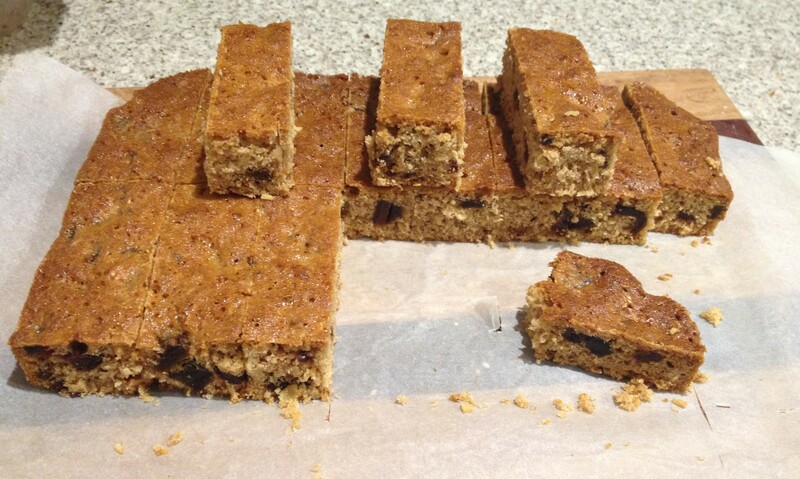 The recipe makes a sturdy, long lasting bar full of wholemeal flour, coconut, oats, dates and honey that lasts several weeks at least and would be great as an energy bar for camping, cycling etc, but is also delicious for lunch boxes or with a cup of tea. I didn’t realise until I weighed it that there is a somewhat terrifying amount of honey in this, but it does make 30 to 60 bars depending on the size you choose – the pan I use made 32 large bars, which could easily be halved to make 64 squares if you prefer. The honey is a significant ingredient here, so use a honey you like! I use this one. Preheat oven to 180C. Line a large baking pan (I use, wait for it, this one) with baking paper. Finely chop dates. Combine in a large bowl with flour, coconut and oats. Gently melt together the honey and butter, I use a pyrex jug in the microwave at 50% power, but you could also use a saucepan over low heat. 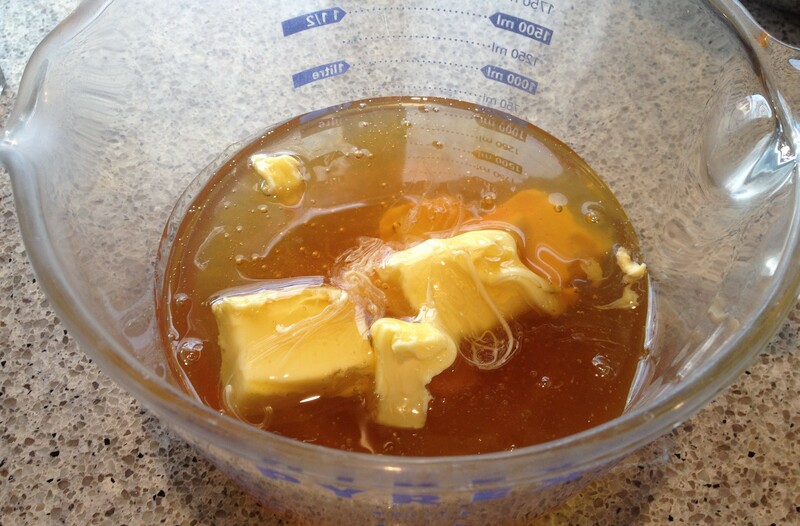 The butter should be completely melted, and the honey quite liquid. 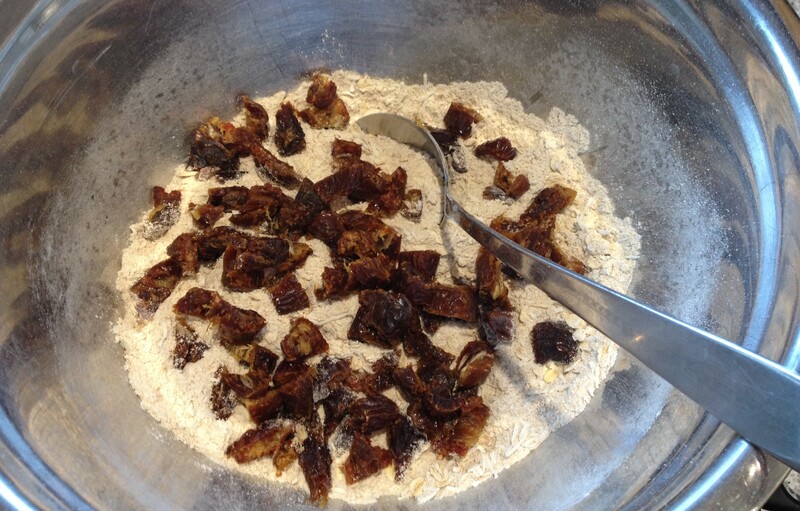 Now stir the honey and butter into the dry ingredients, mixing until thoroughly combined. Spread the mixture evenly into the pan, sprinkle with sesame seeds, and bake for about 30-35 minutes until dark golden and just firm. Don’t overcook – it will firm up quite a bit as it cools. 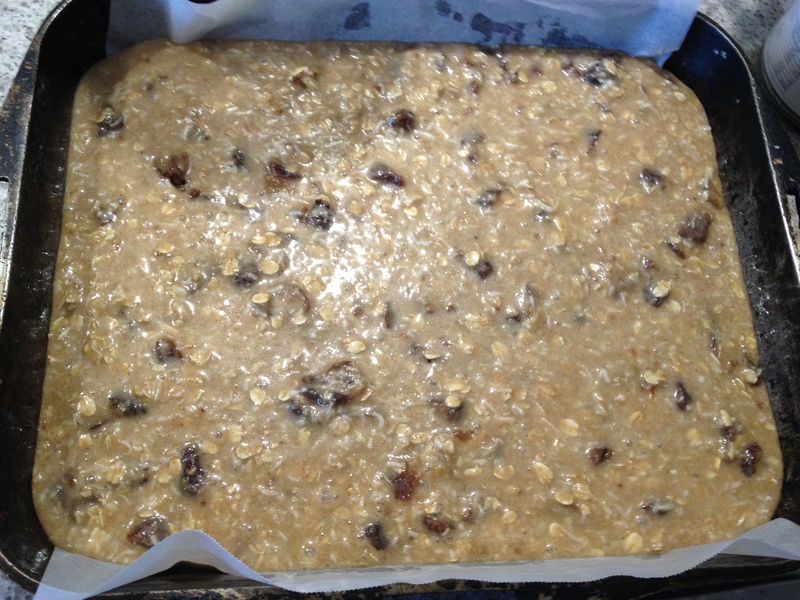 Cool in the pan on a rack for about an hour before turning out and slicing into bars. With a large pan like this, the edge pieces are chewier and the middle cakier so it also caters for all tastes on the cakey to crispy spectrum! Like gingerbread, these are best if left for a day before eating. These sound delicious! I’m always looking for healthier (low sugar) snack bars. I also agree with you about recipes being connected to people — it’s really nice to cook someone’s recipe, as a reminder of that friend/family member, and to share it with others. Wow! That family pan has certainly proved to be useful. And what a lovely way to enshrine memories – through people and food combinations! The bars look delicious. Do you store them in the fridge? Any suggestions for making them gluten free? You can get European gluten free oats so the only other thing is substituting a whole grain flour for the wholemeal wheat flour. The honey is the main binder so I think you could use something like sorghum or millet flour; or use half one of those and half ground almonds…what GF flours can you get? PS Can you please post the recipe for Ken’s chook pie? On my list 🙂 I might need to make a couple of times before posting as it was always a pretty free and easy ‘recipe’! Today made Margie’s chocolate cake for the Montessori fair tomorrow. You guys should come! Yum! I’d eat these by the tray full…hmmm, that could be a problem. These bars sound healthy and look delicious. I should make some for snacking!!! Just make sure you’ve got a full honey jar!